FORT MADISON, Iowa, May 26, 2010. - Local high school students Lynnely Parker, and Bailie Bryant recently returned from the Intel International Science & Engineering Fair (ISEF) held in San Jose, CA earning 4th place overall for teams. Their project, "A Combined Approach: Comparing Liquid Runway Deicer Performance and Characteristics with their Impact on Aircraft Corrosion, Catalytic Oxidation, the Environment and the Economy" was presented the week of May 9th, competing against 1,500 other contestants. The theme for 2010, Mentoring Global Innovation, inspired Parker and Bryant to compare three liquid runway deicers for their ice melting capabilities, corrosive effects on aircraft aluminum alloys, their catalytic oxidation of carbon brakes, their environmental characteristics and their cost. The girls were excited at the final event, Parker said, "We were very happy with the success of our project this year. We put in a lot of hours during the fall and winter months researching and performing our experiments." The journey began at the Iowa Junior Science Symposium in Iowa City, IA in February, where they earned a trip to the National Junior Science Symposium in Bethesda, MD. Competition continued on March 8th at the local conference in Burlington, Iowa, where they took 1st place. 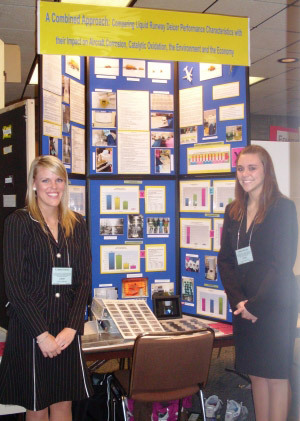 The pair then visited the Eastern Iowa Science Fair in Cedar Rapids, IA on March 20th for another round of judging. Here they won the US Metric Association Award of Merit, Class 1 Senior Physical Category and Senior Champions, for a trip to participate at the ISEF Fair in San Jose, CA along with students from 55 other countries. Leading up to the ISEF competition, the girls participated at the State Science Fair of Iowa in Ames, IA on March 26th, where they were Team Champions. The girls finished off strong for their final year competing, "We made it to Internationals last year too, but as Seniors, we wanted to be sure to go out on a high note and we did. We are very thankful to have been able to work with Cryotech and its employees throughout our science fair years. It's great to know there are companies out there who support students and science. The science fair experience has provided us with valuable tools we will be able to use throughout college and life, not to mention great memories from all the fairs and trips involved," Parker expressed.